The Carbide Series Red SPEC-04’s bold, angular, hard-edged exterior combined with excellent cooling adds bold styling with ease of assembly. The sleek, tinted window shows off a roomy interior which fits up to five 120mm fans and can accommodate massive storage configurations. The clean front I/O panel (with USB 3.0), cable routing cutouts, tie downs, and built-in dust filters combine to help you build a system that’s as bold as the Red SPEC-04’s design. Customise your SPEC-04 red with ease. You can also keep your build looking tidy by hiding your cables behind the motherboard tray this also allows for improved cooling. The additional cooling potential of up to five 120mm fans. Hover over the above image to show the interior of the Carbide SPEC-04 Red. Great airflow doesn’t have to be noisy - the red LED accents the SPEC-04 red with brilliant red light, this fan can push good amounts of air across your hottest devices without that annoying fan hum, and the direct airflow design of the SPEC-04 provides an excellent path for cold air to get to your hottest parts. The asymmetrical, hard-edged design brings bold styling to your build. The red accents on the front of the case compliment the black of the case, this coupled with the red LED fan shining through the front mesh makes for an amazingly stylish case. The Carbide SPEC-04 has an easy access side panel that is home to one USB 3.0 port, one USB 2.0 port, 3.5mm microphone and headphone jacks, power on and reset buttons. 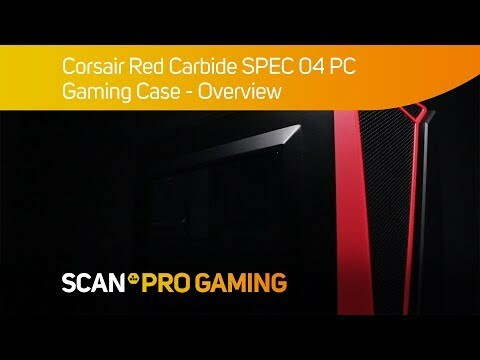 Corsair Carbide SPEC-04, Black/Red, Mid Tower Computer Chassis, ATX/MicroATX/Mini-ITX, with Window, 120mm Red LED Fan is rated 3.0 out of 5 by 1. Rated 3 out of 5 by SF1862 from Attractive design but not a great case and poorly laid out This is quite an attractive case and when powered on, the red LED fan makes the red plastic sections glow. It comes with only one red LED fan in the front but has space for five. The case is OK quality. Much more plastic than the Corsair 200R but of a similar size and layout. Internally the case is fine with no sharp edges and it is easy to work with. The strange thing is the window is nice and large and you'd want that facing you, but the power button, USB and audio sockets and LEDs are on the other side of the front of the case. The front panel does not open and there is no space for an internal DVD drive. For £55 I don't think this is the best case money can buy. Even if they'd put the buttons and front ports on the same side as the window, I still think this case is a little way off four stars. Two stars was a bit stingy though.